A once-in-a-lifetime experience, right off BC’s coast. There’s something to be said about the majesty of watching these giants of the sea in all their glory while your boat skips along BC’s coastal waters. While Orcas are often the main attraction, humpback, gray, and minke whales can be seen depending on the time of year. Keep an eye out for the Orcas of the Salish Sea, three pods (families) of resident Orcas that live and play in the waters off the BC and Washington coast. You’ll embark on your journey from the historic village of Steveston on a state-of-the-art, Coast Guard-certified boat featuring washrooms and other amenities. Your professional guide and naturalists will provide you with knowledge about local marine life and ecosystems, with some vessels providing hydrophones to hear the sound of whales vocalizing. Taking place between April and October (whale migration season), expeditions weave through the Strait of Georgia towards the Gulf and San Juan Islands. Operators maintain a distance of 100 yards (around 100 metres) from the whales, according to guidelines established by the Pacific Whale Watch Association, to give you an excellent view while respecting the whales’ wild habitat. Don’t forget your camera! You won’t just see whales, either. Keep an eye out for seals, porpoises, otters, eagles, and other birds. 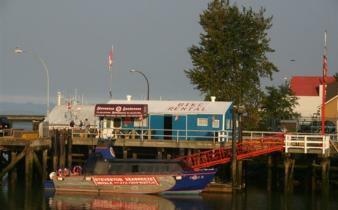 Along with whale watching tours, both Steveston Seabreeze Adventures and Vancouver Whale Watch offer sea lion tours from April to approximately mid-May. That’s because thousands of male sea lions migrate to BC’s coastal waters from California. The "California Bachelors," as they’re called, hang out at the Steveston jetty for the spring before heading home. 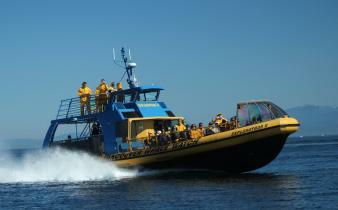 There is a 90% whale sighting success rate, and if whales are not spotted, operators will offer you a free return pass. 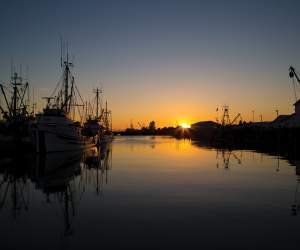 If you&apos;re staying in Vancouver, it&apos;s just a 40-minute drive to Steveston! Be sure to ask about shuttles from downtown Vancouver (and Richmond, too). Nature as diverse as Richmond itself. Step foot in the historic fishing village of Steveston. From biking and fishing to geocaching and golfing, it's easy to enjoy the outdoors in Richmond.